Happy Thursday Everyone! It’s time for another Create with Connie and Mary Thursday challenge and this week we have a cool sketch for you! 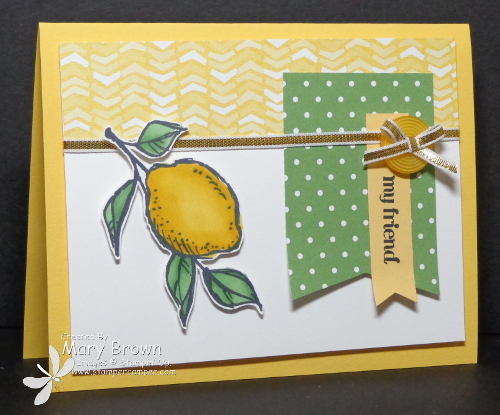 I’m really liking this lemon stamp…it’s soooo much fun to cut out…yep…I do LOVE to cut things out! That makes me HAPPY!! Whisper White – 3 3/4 x 5. Stamp lemon image using Memento Black on Whisper White. Color using Daffodil Delight and Wild Wasabi Blendabilities. Cut out and add to card front using dimensionals. Add Crush Curry (SAB) button using Glue dots. Tie bow in Gold 1/8″ Taffeta Ribbon. Add to button using Glue Dot. 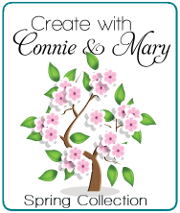 We just about finished up week 3 of Create with Connie and Mary Spring Collection 2015 – and it’s still a GREAT time to subscribe! We have had some AMAZING card sets this week. Our subscription is full of gift ideas, home decor, card sets and 3D project tutorials perfect for your stamp camps and classes! We’re using Occasions and Sale-A-Bration products from Stampin’ Up!’s Catalogs. Get over 24 projects for only $29.95 US…that’s just a little over $1 per tutorial! More details over on Create with Connie and Mary! This entry was posted in Blendabilities, Create with Connie and Mary, Sale-a-bration and tagged A Happy Thing, And Many More. Bookmark the permalink. Love how you stamped your sentiment vertically. The gold ribbon really adds a touch of elegance – great idea! Such a bright and happy card! Love the lemon image! And what a fun way to do the banners! What a fresh and bright card! Love the lemon and the colors/papers you used! Fun card! So fresh and bright! Love the addition of the gold shimmery ribbon, too! It’s amazing, your card is so refreshing!! I can wait to get this set and try it out!